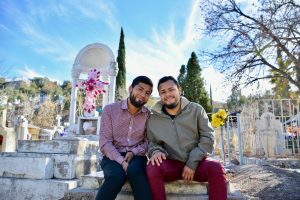 Kevin (right) with his brother Jason in the Nogales Cemetery, where they shared their story with KBI interns. January 2019. Central American migrants, fleeing their homelands to escape the extreme violence there, are beset by more dangers as they travel through Mexico. Crimes, such as extortion, robbery, and kidnapping, are common, and many migrants encounter discrimination, corrupt government officials, and deportation. Kevin shared his story with the KBI, an account that illustrates how harrowing the journey can be. My name is Kevin, and I’m 24 years old, born and raised in a district of Guatemala City. My brother Jason is 25, and we’ve been nearly inseparable since birth. I’m the dancer and talker of our family, while my brother is a bit more quiet. Over the past few months, we migrated thousands of miles through Guatemala and Mexico with the hope of entering the United States soon. We both have children back in Guatemala—I have two children, Allison and Kevin, who are ages 4 and 2, and my brother has a 6-year-old son named Angel. Our family’s first contact with the United States was 19 years ago when our parents migrated there. We have not seen them since then, and because they rarely call, they haven’t known what life is like here at home. After they left, our grandparents raised us, which wasn’t easy. My grandfather was an angry man. Having been an orphan himself, he took his frustration out on us. He would punch us in the gut and spray us with a hose even though we would often give him 3-hour massages to ease his diabetic pain. That was our life growing up—go to school, work in the field with the goats, massage, sleep, repeat. Still, I saw good in my grandpa. Because of his strictness, we are polite and well-behaved. After we graduated from middle school, we went to work riding buses and collecting ticket money. But things were getting dangerous. In Guatemala, there are vigilante groups called Patrulleros. They are armed and operate as “law enforcement” in many neighborhoods. They ask for quotas from the neighbors as compensation for their protection. But over time, they developed too much power, and became violent and reckless. We knew we had to leave. When we heard the news that our Uncle William was being deported from the U.S. back to Guatemala, we decided to travel north altogether. William could not stay in Guatemala—both his brothers had been murdered by gangs in our hometown, and he had multiple children in the U.S. Because we didn’t know where we were going and it was over 2,000 miles of unknown and likely dangerous territory, we hoped William could help guide us. As we set out for the Guatemala–Mexico border on October 15th, 2018, we had to pass our first test—getting past the Mexican border patrol. With three other migrants, we snuck around their patrol station for two hours until we ran into a gang waiting for migrants in the bushes. They ambushed us, forced us to strip naked, and searched through all of our clothing and valuables from our backpacks. My brother and I were quiet, but my uncle resisted, which earned him several forceful blows with the backside of a machete that left his head slashed. Lots of blood lost, and scars that he still carries. The gang members already had piles of valuables from previous raids with coins from many different countries—Pesos (Mexico), Quetzales (Guatemala), Lempiras (Honduras), and more. When they finally moved on, the mafia left us with 200 pesos ($12USD) collectively, all we had to take a bus ride into Mexico. Not enough, since bus drivers charge more for migrants from Central America. For example, a bus ride might normally cost 30 pesos (about $1.50USD) but they would often charge 100 pesos ($5.25USD) for migrants. Looking back, my brother, uncle, and I finally made it to Chiapas, Mexico through sheer will. At that late hour, it was pouring rain, and we arrived soaked at a migrant house. The man who answered the door was angry, telling us there was no room. So we made our way to a park in the cold where we shivered through the night. The following day, while we were waiting for a train, we came across the Mexican migration officers (La Migra), who chased us, but thank God, we escaped. Anywhere in Mexico, we have to be on the lookout for La Migra, ready to flee at any second. When we returned to the train station, we were once again chased by La Migra, and Jason and William were caught and deported. Our group planned to wait for them until they could return, but we were continually needing to escape the notice of La Migra. We could be eating, resting, even urinating—always aware that La Migra might be right around a corner—so we moved steadily to avoid their surveillance as they patrolled near the Mexico–Guatemala border. After all this, we were only barely in Mexico. Following the train tracks, I met Victor, a 20-year-old Guatemalan, and we continued north together. Along the way, we encountered other migrants, and helped mothers carry their babies. In the next state north, Oaxaca, still thousands of miles from the U.S., we ran into more gangsters from the cartel. Again we were stripped and robbed of everything, even the baby’s clothing and food. Where were their hearts? Even after being robbed again, we continued through Oaxaca, only to be kidnapped along with a 13-year-old by the cartel members. They drove us in a pickup to a remote ranch, and locked us in a dimly lit room with bloodstained walls and bullet casings on the ground. The cartel demanded money, threatening our lives. Luckily, I had hidden some bills, and was able to dig them out to pay the quota for Victor and myself. The teenaged boy didn’t have any money, and was forced to stay and work for the cartel to meet their quota. As we continued on, we found refuge in churches with good Samaritans who cared for us. They brought us food and kept us warm. Good people know the atrocities that migrants moving through Mexico are subjected to, and we remain grateful to them. Nevertheless, the hardships never ceased. I finally made my way to Nogales on my own, where I found food and friendship at the KBI comedor and was eventually reunited with my brother Jason and my Uncle William. That was 2 months ago. But even here in Nogales, we’re not safe. At a bank to withdraw money sent from Guatemala by my family, I was approached by a police officer on my way out. He demanded money from me, but I said I didn’t have any. He knew I was a Central American, and grabbed me aggressively, taking everything. Even though people saw what happened, they did nothing. That cop knew he could get away with extorting migrants. If the police are committing crimes, who isn’t? Now that my brother has rejoined me, I feel better. We trust each other with our lives. We’re always there for each other—to pull each other up on trains, to drag each other through the desert, to offer each other love and support. We have always been together. When I think about the horrors we’ve experienced and the uncertainty ahead, I remember that we’re crossing for our kids. We want them to have a better life so they don’t have to endure what we have. We will send back support so that they don’t have to cross rivers, stay awake and cold at 3:00 am, walk for days without food, or crawl on hands and knees around border patrol stations for hours. We are fueled by our faith in God, as we seek safety and salvation. Faith can be as small as a mustard seed, but can move mountains. Many thanks to Christopher Prokosch, a senior majoring in chemistry from St. Olaf College in Minnesota, who wrote this story from interviews with Kevin. We are also grateful to him and his classmates, Avery Ellfeldt (journalism), and Matthew Douglas-May (environmental studies), for devoting their January terms to interning with the KBI.